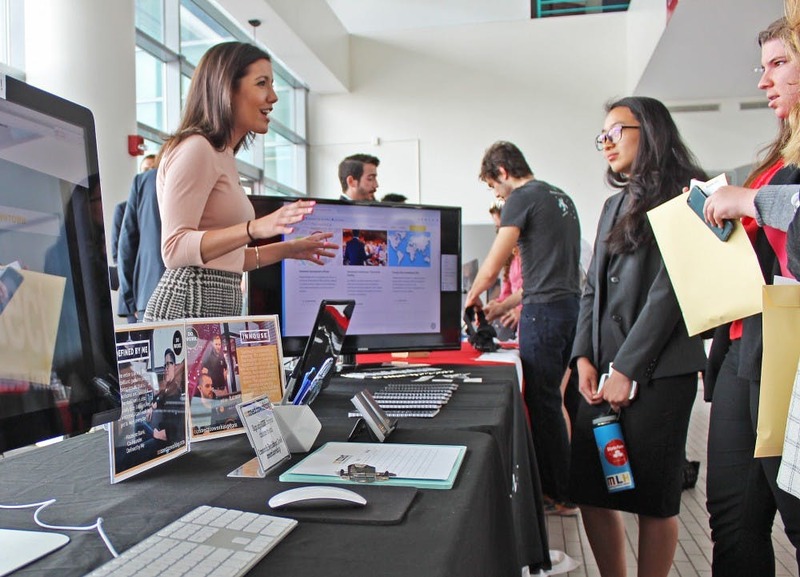 Former Finance major and intern analyst Courtney Ehland represents the Stage Exchange platform at the McGuire New Venture Competition on April 28 in McClelland Hall. The Social Impact Summit, hosted by Eller’s McGuire School for Entrepreneurship, kicks off the third day of the TENWEST Festival. The University of Arizona will host the Social Impact Summit Monday, Oct. 16. A creation of the McGuire School for Entrepreneurship, it is launching as the third day of Tucson’s TENWEST Festival. It intends to bring together the nonprofit and business communities with public and educational leaders to discuss innovation, collaboration and social impact. Monday’s activities begin at 8 a.m. with coffee and networking. The day will continue with keynote speakers, workshop and panels, and end with a pitch competition and cash prizes. There will be five main categories for round tables and panels: driving organizational capacity for change, entrepreneurial growth (specifically for women, veterans and youth), global impact and innovation, sustainability and next generation growth. Richard Yngve, a McGuire Center faculty member and one of the creators of the event, is particularly excited for the global tract. There will be entrepreneurial development leaders from Uganda, Tanzania, Columbia and Mexico speaking, as well as many UA faculty who have taught from locations ranging from South America to Australia. Yngve encourages students to attend because he said they need a more holistic understanding of both the needs in their communities and how they can make an impact. He said recruiters for companies want employees that are passionate about causes. Part of what excites Yngve is the summit not only looking at economic impact, but also incorporating social value and cultural value. Monday’s event will be dedicated to looking at innovation and impact across Southern Arizona. Another focus will be Corporate Social Responsibility, or CSR, the idea that companies have a responsibility to focus on more than profit. In today’s world, businesses are expected more and more to be part of their community or contribute to the greater good. Yngve said the pendulum is swinging away from profit-centric business models and toward social responsibility of companies to their communities. One company that embraces the principles of CSR is Microsoft, who is sponsoring the Social Impact Summit’s. In 2016, Yngve helped facilitate a partnership between Microsoft and the University of Arizona. Through this collaboration, students are able to leverage Microsoft technology, talent and partnerships to explore social impact projects. Thanks in large part to Microsoft’s sponsorship, the McGuire Center was able to host the Social Impact Pitch Competition. The competition is unique due to its design. It’s specifically for new ideas and ventures and the goal is to create an opportunity for great ideas to gain momentum. Twenty-two applications were entered to the competition, ranging from high school students to seasoned executives. Monday’s field has been narrowed down to six applicants, three of whom will be declared a winner on Monday night. They will be awarded amounts of $15,000, $10,000 and $5,000. The Social Impact Summit is intended to seed ideas and collaborations. “This is just the beginning,” Yngve said. The McGuire Center is already planning how to grow the summit next year. Any university clubs or organizations interested in participating are encouraged to contact the center. Tickets for Monday’s event are $10 for students. These tickets will also allow entrance to the TENWEST Festival, excluding private events. If the ticket cost presents a barrier for students, they can email [email protected] for help.